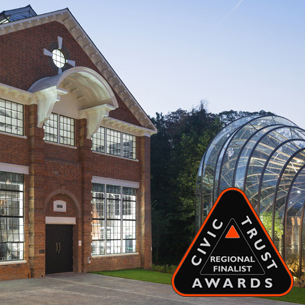 The Bombay Sapphire Distillery and Visitor Centre has been announced as a 2017 Civic Trust Regional Finalist. The scheme is one of 128 national and international projects to be recognised by the Trusts Awards scheme, which date back to 1959. It is the longest standing, independent built environment awards scheme in Europe and continues its objective to recognize projects that have made a positive contribution to the local communities they serve. The national award winners will be announced in December ahead of the Annual Civic Trust Awards Ceremony at the Guildhall, Winchester on 10th March 2017.